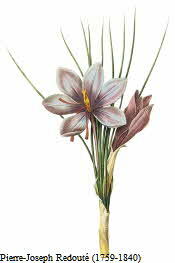 Each saffron crocus flower has 3 stigmas, it takes about 80,000 flowers (240,000) stigmas to make a pound of saffron. It takes an experienced picker about 12 days to pick this many. By the time saffron gets to retail stores, its cost is $600 to $2000 per pound. In 1444 any merchant caught selling adulterated saffron in Bavaria was burned alive.